Make It! 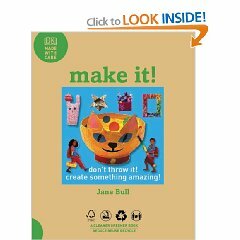 by Jane Bull is A Cleaner Greener Book, this wonderful book contains basic information (turning trash to treasure & The 3 R’s), teaches kids how to sort recyclable materials (and focuses on donating to charities). Then it launches into numerous step by step instructions for making new things from our trash. If your house is anything like mine, you likely have a multitude of little plastic toy parts. I’m constantly collecting tiny doll shoes, plastic spiders, bouncy balls, etc… and TOSSING THEM IN THE TRASH. Not anymore! This book shows us several ways to reuse all those little toy bits that we cannot donate. I can see many valuable educational opportunities arise out of these projects as well… for instance, my preschooler can enjoy sorting all those little toys by color groups and then can make a rainbow picture frame. While turning to the back cover of the book, I found, “This Book Was Made With Care”. The paper is FSC certified, the printer has reduced its carbon footprint by 52% since 1996 and generates all its own electricity, the inks are vegetable (no petroleum), no dust jacket (which reduces paper and energy and the company pays close attention to human rights, labor standards, the environment and anti-corruption. For more information, visit www.dk.com/madewithcare.